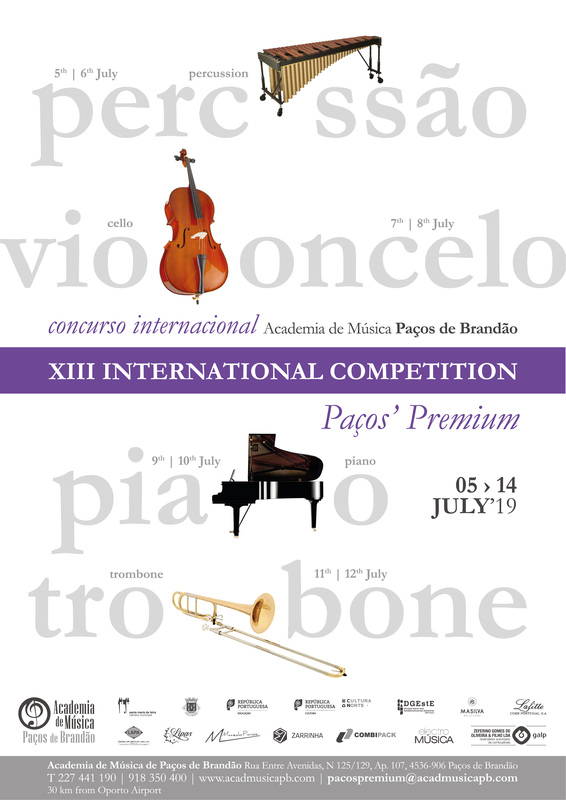 The XIII “Paços’ Premium” – 2019 International Music Competition, which will cover the categories of Percussion, Cello, Piano e Trombone, will take place from the 5th to the 14th of July 2019, at the Paços de Brandão (Portugal) Music Academy Auditorium. The competition is geared to students in various levels of specialized artistic musical education: beginners, elementary, secondary and advanced. This competition is held annually. The goals of this competition include fostering the study of music, promoting learning exchanges among students from various schools and nationalities, encouraging students to achieve new levels of performance, and developing a taste for classical music. The Competition’s Organizing Committee comprises the AMPB’s String, Wind and Keyboard Departments, under the artistic direction of Educational Direction (Alexandra Trindade, Marina Pereira and Joana Anacleto).